Iraq and Turkey are threatening to go to war with each other over who should hold power in Mosul and the surrounding region after the defeat of Isis. 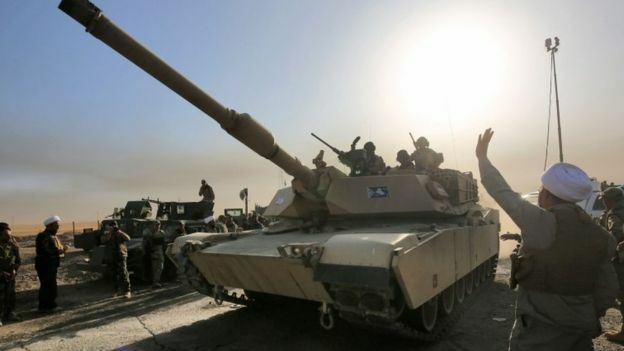 Turkish tanks and artillery have deployed along the border and Iraqi Prime Minister Haider al-Abadi has said that while Iraq “did not want war with Turkey” it is ready to fight one if necessary. The confrontation is sharpening as the Iraqi Army enters eastern Mosul and Shia militia known as the Hashd al-Shaabi advance towards the town of Tal Afar, threatening to cut Isis’s last escape route from Mosul to Syria. Turkey sees itself as the protector of the Sunni Arabs of Mosul and northern Iraq, a community left vulnerable by the likely defeat of Isis by Shia and Kurdish forces backed by US-led airpower. The dependence of the anti-Isis forces on air strikes and drones was underlined on Wednesday when Iraqi Special Forces delayed their advance into east Mosul because high humidity and clouds made it difficult for aircraft to identify and attack targets on the ground. They had entered the industrial suburb of Gogjali on Tuesday and were Wednesday going from house to house looking for Improvised Explosive Devices (IEDs) and booby traps. The population of Mosul east of the Tigris River, which divides the city in half, has in the past consisted largely of well-educated professional people such as doctors and engineers, few of whom are likely to be sympathetic to Isis. Residents in the east say they expected Isis to withdraw to the western side of Mosul, which is more sympathetic to them, crossing the five bridges spanning the Tigris which, the residents say, have been rigged with demolition charges. The Iraqi government reacted angrily to the possibility of Turkish intervention. “The invasion of Iraq will lead to Turkey being dismantled,” said Mr Abadi at a news conference in Baghdad on Tuesday. “We do not want war with Turkey, and we do not want a confrontation with Turkey, but if a confrontation happens, we are ready for it.” He added that Iraq would consider Turkey as an enemy and would deal with it as an enemy. The exchange of abuse between Ankara and Baghdad continued on Wednesday when Turkish Foreign Minister Mevlut Cavusoglu denounced Mr Abadi as “weak”, asking: “If you have the strength, why did you surrender Mosul to terror organisations? If you are so strong, why has the PKK occupied your lands for years?” Earlier Turkey’s deputy prime minister Numan Kurtulmus had tried to lower the temperature by saying that the military build-up was a precaution and not a threat. Iraqi leaders in Baghdad have long privately blamed Turkey for aiding or tolerating al-Qaeda-type movements like Isis which operated in Iraq, but the ill-will is now becoming more public on both sides. On 11 October President Recep Tayyip Erdogan launched a furious tirade against Mr Abadi, saying: “He insults me. You are not on the same level as me! You are not my equal! Scream all you want from Iraq! It will not change anything! We will do what we want to do.” On 23 October, Mr Erdogan further raised the stakes by asserting Mosul has historically belonged to Turkey and it should therefore play a role in determining its future. Turkey already has 700 troops at a base in Bashiqa, north of Mosul, and has been training a Sunni Arab militia force of former policemen from Mosul numbering about 2,500. This force is probably not big enough to make Turkey a player in the struggle for the city and political observers in Irbil believe Turkey will not intervene militarily. But this could change if the Hashd attack Tal Afar, whose Turkman population is about 80 per cent Sunni and which is the home town of many Isis commanders, judges and religious police. Turkey would also be energised if the PKK was visibly benefiting from developments in and around Mosul. Another more cynical interpretation of Turkey’s focus on Mosul is that it is to divert attention from its muted response to the Syrian and Russian assault on East Aleppo. The fall of Mosul is likely to give birth to a series of crises because the province of Nineveh, of which it is the capital, is a mosaic of warring sects and ethnic groups. After years of war these are divided by deep hatreds, with Yazidis, Kurds and Christians all accusing their Sunni Arab neighbours of complicity in Isis massacres. In Nineveh Plain most of the Sunni Arabs have fled into Mosul city fearing revenge from returning Christians and the Shabak minority who are largely Shia. Revenge is taking place within sectarian and ethnic groups, some of whom joined Isis while others fought it. Amnesty International says that pro-Iraqi government Sunni tribal fighters taking part in the Mosul operation are carrying out revenge attacks on men and boys in “liberated” areas suspected of belonging to Isis. Fighters from the Sabawi tribe, originally from Mosul, are said by Amnesty to have illegally detained civilians, beaten them with metal rods, given them electric shocks and tied some of them to the bonnets of vehicles and paraded them through the streets while others were placed in cages, according to interviews with local officials and eyewitnesses. Many people displaced from Mosul and surrounding towns and villages say they will not return home until security is restored and this is still a long way off.